Six days a week from 7:30am to 11:30am Sopheak still wanders along the beachfront, but now she is a youth volunteer helping other children who make a living on the street to avoid becoming victims of abuse. Sopheak talks with children working at the beach to check if they face, witness or hear of any abuse. In 2012 Sopheak’s life took an unexpected but positive turn. 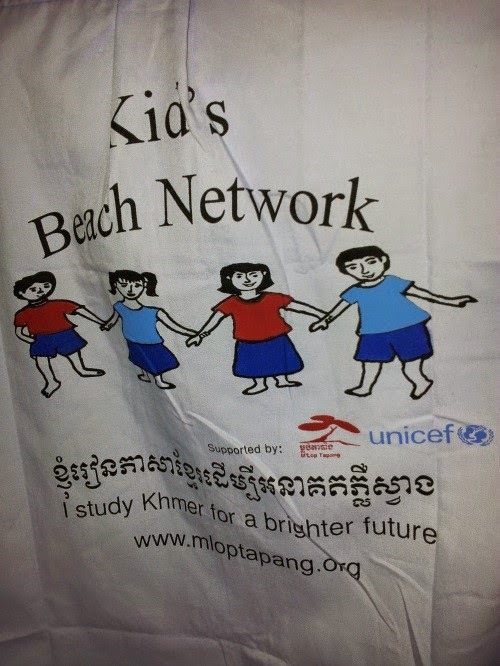 She met an outreach child protection team from the UNICEF-supported non-governmental organization (NGO) M’Lop Tapang, based in Sihanoukville province, which invited her to a free social training event where she learned about child rights and how children can protect themselves from abuse. As a result of Sopheak’s enthusiasm and interest, in March 2013 she was selected to become a core youth volunteer with the protection team. M’Lop Tapang holds these training events twice a year for young people who live and/or work on the street as part of its community-based and outreach programme for vulnerable children and their families. The NGO also provides education, vocational training, counselling, medical care, drug rehabilitation and family reunification services, emergency shelters, sports and arts activities. It is one of nine NGO members of the Partnership Programme for the Protection of the Children known as ‘3PC,’ which aims to strengthen and coordinate civil society’s involvement in the child protection system. The partnership advocates for national policies to protect children, and raises awareness on child protection issues at local level in an effort to improve the quality of child protection services. Sopheak and Jane work together to eliminate child abuse around Ochheuteal beach in Cambodia. The partnership is made possible with funding from donors including the German and Japan Committees for UNICEF, the German International Cooperation Agency (GIZ) and the USAID Displaced Children and Orphans Fund (DCOF). Sopheak enjoys her new role. ““I usually talk with 30-50 children per day around this beach to check if they have faced, witnessed or heard of any abuses,” said Sopheak. She reports to M’Lop Tapang any incidents of child abuse that occur in the beach areas. Youth volunteers like Sopheak also oversee M’Lop Tapang’s ‘Kid’s Beach Network’ a ‘child safe programme’ organized with 70 children under the age of 15. Members of the Network help in reporting child abuse cases to Sopheak and M’Lop Tapang staff. Their distinctive T-shirts send a strong message to tourists to help end child abuse and also deter abuse by declaring children’s membership of the Network. It's very inspiring.. Even they are young, they still manage to help other kids to guide them how to fight child abuse. I am so happy to read this post!